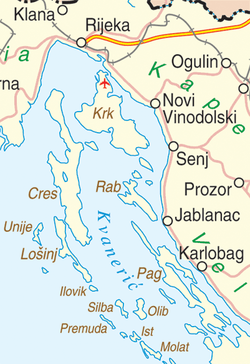 The Kvarner Gulf (Croatian: Kvarnerski zaljev, Italian: Golfo del Quarnaro or Carnaro, Latin: Sinus Flanaticus or Liburnicus sinus), sometimes also Kvarner Bay, is a bay in the northern Adriatic Sea, located between the Istrian peninsula and the northern Croatian Littoral mainland. The bay is a part of Croatia's internal waters. "Kvarner (Kvarnerski zaljev)". Istrapedia (in Croatian). Retrieved 14 October 2012. This page was last edited on 5 April 2018, at 17:25 (UTC).